A technology initiative is raising awareness of how tech can help refugees find aid and education, by presenting its ideas at 10 Downing Street today. Techfugees, founded by tech blog TechCrunch’s editor-at-large Mike Butcher in September last year, aims to bring the industry together through a collation of different projects aimed at helping Syrian refugees. The group has worked with companies such as Google to both develop new technologies and raise awareness of existing innovations through conferences. The group presented its ideas at the Syria Donors Conference today, where prime minister David Cameron and other world leaders discussed the refugee crisis. This followed the #TechfugeesLIVE conference yesterday, which saw a range of speakers talk about how tech could help refugees. Projects that have come out of the non-profit initiative include Google’s Refugee InfoHub, an app aimed at assisting safe travel, RefugeeAidApp, a location aid app used to find nearby resources such as food, shelter and medical care, and GeeCycle, a website and app that enables people to donate old smartphones to refugees, among others. Butcher says that the Techfugees initiative is about “shining a light” on technology to make “both refugees and NGOs” aware of resources. 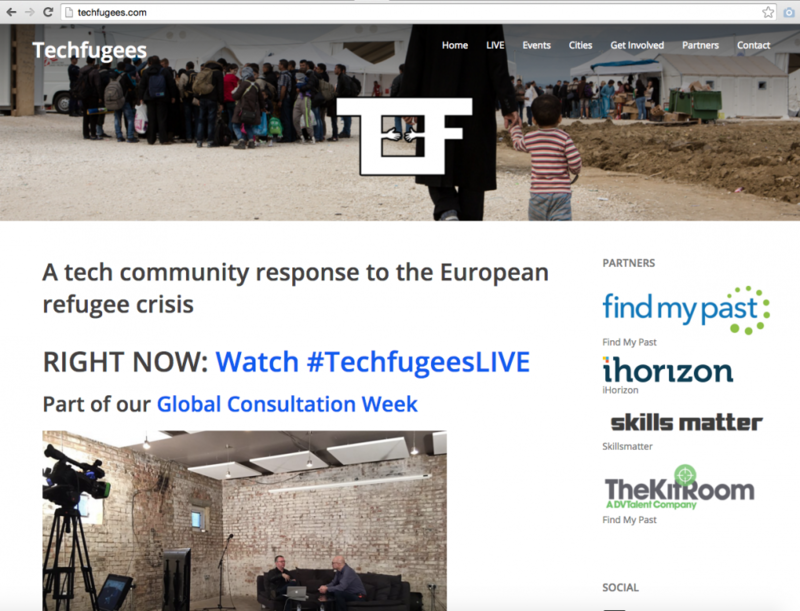 NGOs such as British Red Cross and Save the Children have previously spoken at Techfugee events. Migreat, another app that has come out of the initiative, is a legal tool to help make sense of the asylum seeking process in Europe. Its founder Joséphine Goube, who has also been involved in curating projects for the Techfugee programme, adds that mobile phones are a “lifeline” for refugees, not just for communication, but also in giving them a voice. Techfugees has focused on mobile and website applications, with some hardware such as inflatable incubators and 3D-printed prosthetic facilities in refugee camps. In the pipeline is a design-centred initiative, which will focus more on these product design solutions and will be “co-created” with refugees, says Butcher. Another Techfugees conference is set to take place in New York next week.